A modern fuel stabilizer, Phaser 3000® is recommended for use in gasoline or diesel* engines to increase performance, reduce downtime, clean, neutralize the harmful effects of engine acids, remove carbon, gum, sludge, and varnish from valves, cylinders, pistons, fuel injectors and carburetors.When ethanol blended gasoline reaches its saturation point because of contamination with H2O, multiple layers are formed. The top layer is gasoline with a lower octane rating, and the bottom is a mixture of water and ethanol that will not ignite during engine combustion. If ethanol blended gasoline reaches this state, a phenomenon known as Phase Separation, the engine can be detrimentally affected. This is where Phaser 3000® is necessary because it can actually return these separated layers back to one clear, homogeneous mixture. 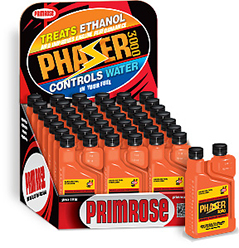 In this process, Phaser 3000® absorbs H2O molecules in the phase separated gasoline by breaking the ethanol-water H bond and encapsulating the H2O molecules, thus returning the separated layers back into one mixture. The H2O molecules that are absorbed in Phaser 3000® are then eliminated during the normal combustion process of an engine. Phaser 3000 Prevents and Reverses Phase Separation.